With the winter storms in full swing, there is nothing like a hot bowl of soup to warm one up. When you've found some allergy~friendly options, it makes having a quick meal even easier. We recently found that one of our favorite soups comes in two versions. One those with MILK and EGG allergies can eat, and one that would need to be completely avoided. 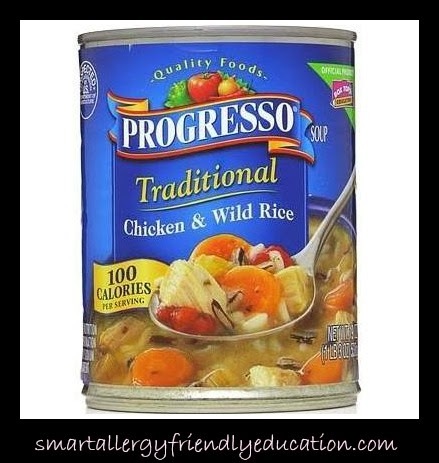 PROGRESSO Traditional Chicken and Wild Rice soup and PROGRESSO Reduced Sodium Chicken and Wild Rice soup are both distributed by Progresso Foods Division, General Mills Cereals, LLC. Somehow when I purchased the Reduced Sodium version, I failed to see the 'FOOD ALLERGIC CONSUMERS SEE INGREDIENTS LIST FOR NEW ALLERGENS' print in the upper left hand corner of the packaging. Ingredients in the 'Traditional' version include: chicken broth, carrots, cooked white chicken meat, tomatoes, wild rice, rice, celery. Contains less than 2% of: salt, chicken fat, corn protein (hydrolyzed), carrot puree, potassium chloride, yeast extract, sugar, soy protein isolate, sodium phosphate, dried parsley, calcium chloride, citric acid, natural flavor, maltodextrin, beta carotene (color). CONTAINS SOY INGREDIENTS. 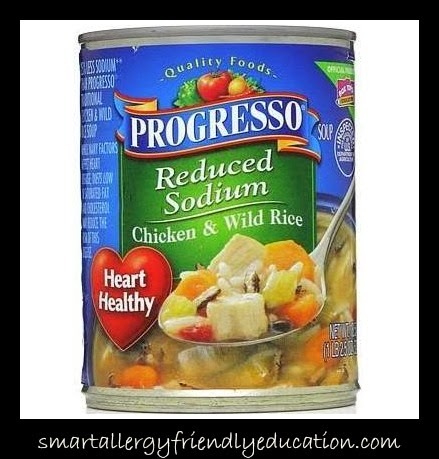 Ingredients in the Reduced Sodium version include (bolded items indicate different ingredients from 'Traditional' version: chicken broth, carrots, cooked white chicken meat, tomatoes, wild rice, rice, celery. Contains less than 2% of : water, modified food starch, chicken fat, potassium chloride, corn and SOY proteins (hydrolyzed), ONION POWDER, SEA SALT, carrot puree, salt, maltodextrin, sugar, yeast extract, natural flavor, GARLIC POWDER, soy protein isolate, sodium phosphate, dried parsley, calcium chloride, EGG YOLK, citric acid, SOY LECITHIN, Beta Carotene (color), MILK. CONTAINS SOY, EGG AND MILK INGREDIENTS. 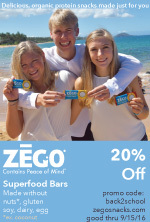 For more information about their products, including GLUTEN FREE recipe ideas, visit: http://www.progressosoup.com/ or 1-800-200-9377. 1. ALWAYS read the labels. 2. With Food Allergies, a 'Heart Healthy' version doesn't always mean healthier for everyone! 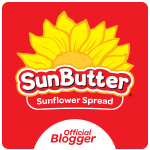 Have you found other brands or products you want to warn others about? Let me hear them and I will share! !